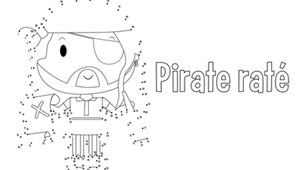 Pirate Raté is also available on Mini TFO A section just for the kids, without ads! Click to explore! 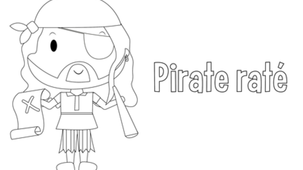 Pirate Raté, a funny, ridiculous and clumsy character, likes to test objects' buoyancy. This often leads him to miss certain objects that have ended up underwater! 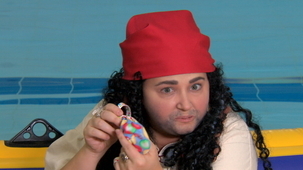 Pirate Raté drops objects in water to test whether or not they float. A bag of candy is the target of the experiment. Oui, oui, oui, c'est la vérité. prendre le bord! Ha! Ha! Ha! à la flotte! Et hop! PIRATE RATÉ lance les bonbons qui flottent sur l'eau. les bonbons flottent sur l'eau. qu'il y a un trésor par là. 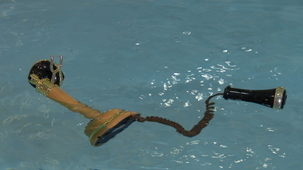 Pirate Raté drops objects in water to test whether or not they float. A telephone is the target of the experiment. 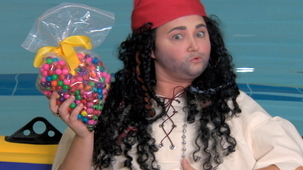 Pirate Raté drops objects in water to test whether or not they float. A cymbal-banging monkey toy is the target of the experiment. Pirate Raté drops objects in water to test whether or not they float. An alarm clock is the target of the experiment. 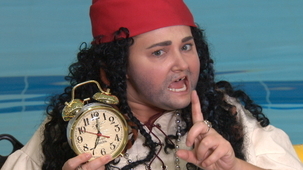 Pirate Raté drops objects in water to test whether or not they float. Pieces of gold are the target of the experiment. Pirate Raté drops objects in water to test whether or not they float. 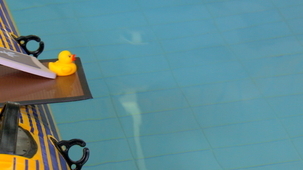 A plastic duck is the target of the experiment. Pirate Raté drops objects in water to test whether or not they float. A disco ball is the target of the experiment. Pirate Raté drops objects in water to test whether or not they float. 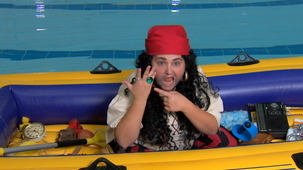 He tests the buoyancy of a ring.